Enjoy spelling? 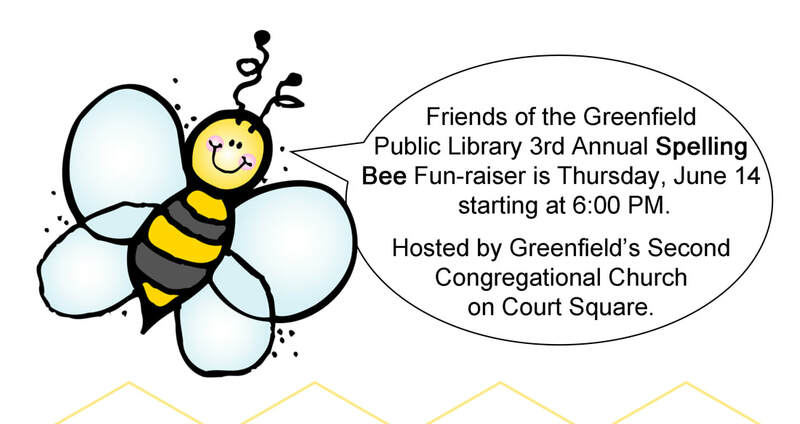 Every June the Friends of the GPL pull together a Spelling Bee in coordination with the city of Greenfield's Bee Week celebrations. Community members are encouraged to grab some logophiles from their hive and form a team of three “bees” to compete with the swarm! Teams can preregister at the library or with the Friends. Contest words from antediluvian to zymurgy will be selected from the Webster’s Third New International Dictionary of the English language. Everyone is bound to increase their vocabulary at this event, and even if they are an abecedarian, community members are welcome to come along and cheer on friends. There is even a costume competition with prizes awarded in various categories. Spelling Bee prizes will be awarded to the first, second, and third place spelling team winners. There is also food, refreshments, and raffles. For more information, details usually are usually announced some time in May. Check out our Facebook page, the Greenfield Public Library, or back on this webpage. Want to form a team? ​Want to be on a team?